Heather Sellers is face-blind—that is, she has prosopagnosia, a rare neurological condition that describes the inability to recognize faces. Growing up, unaware of the reason for her perpetual confusion and anxiety, she took what cues she could from speech, hairstyle, and gait. The truth was revealed two decades later when Heather took the man she would marry home to meet her parents and discovered the astonishing truth about her family, herself, and living with mental illness. In this uplifting memoir, Sellers illuminates a deeper truth: that even in the most chaotic and heartbreaking of families, love may be seen and felt. Heather Sellers is the author of the story collection Georgia Under Water and several books on writing. A poet, essayist, and frequent contributor to O: The Oprah Magazine, The Sun, and other publications, she teaches at Hope College in Holland, Michigan. "You Don't Look Like Anyone I Know does not read like any memoir you know...Unless I've got prose blindness, Sellers is an ace...Her calm, glass-half- full-to-overflowing worldview could, in another writer's hands, veer towards treacle, but she pulls it off beautifully. I predict exciting things for her: critical acclaim, hearty sales, and, perhaps best of all, long lines of strangers at every reading." "Never forget a face? What if you couldn't remember any? Sellers...learns to appreciate the upside: Being blind to faces makes it easier to see herself and those she loves as they really are." 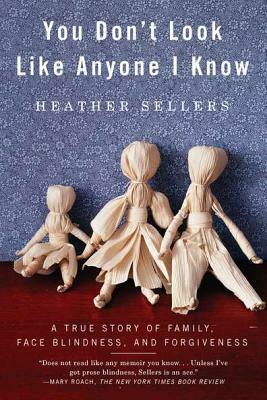 "Although [Sellers] can't recognize others, in this book she has managed to find herself." "Stunning...This is a memoir to be devoured in great chunks. The pleasure of reading it derives both from its graceful style and from its ultimate lesson: that seeing our past for what it really was, and forgiving those involved, frees us up to love them all the more, despite their (and our) limitations."